The first three rows were drawn directly with a ballpoint pen, like the entire first two Tomas comics. For most of the rest of the album, I switched to drawing in pencil first, and inking with black ballpoint (later on, with Chinese ink). Keep in mind that this comic's actual dimensions are 13.7×18 cm (5.4×7 inch), especially when you see how much I started stuffing on each page later on. Also mind the horrible handwriting, a flaw which would persist in almost all the comics except the very last ones (which unfortunately never got finished). I did perform quite a bit of cosmetic surgery on many of the letters after scanning, to allow Dutch-speaking people to read the original text while getting only a minor headache instead of an aneurysm. The writing on this page is still acceptable, though. On the last few pages it would get worse, but I'll tell you more when we get there. Luckily the English translation is in a nice clean font! Clicking the buttons will make the comments pop up under the rows they describe. If there is an button, it displays original sketches. The story starts with a view on some kind of flying contraption. 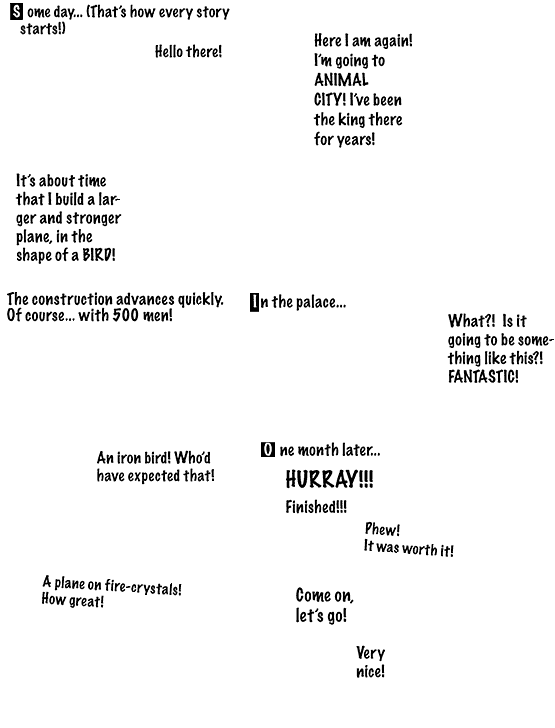 This was supposed to be a type of futuristic plane, featured in some of the early Tomas comics. The funny thing is that even in the original Dutch text I used an abbreviated form of ‘vliegtuig’ (aeroplane): tuig, which is related to ‘contraption’. This was half intentional, because I realised how weird many of the flying things in my comics were. As Tomas says, in this story he is the king of ‘Animal City’, which is rather a small country than a city (but in my then limited knowledge of the English language, that's all the same). This is a departure from the first two comics where Tomas was the ‘king’ of the animal forest: this story runs in the updated universe with the animalised copy of Earth. There are no details as to where AC is located. But I think I imagined it being a new small continent in the middle of the Atlantic Ocean. There is some proof of this on page 3. You might wonder where that palace is. At the age of 9, I found huge skyscrapers way cooler than old buildings, therefore Tomas' palace was a set of two skyscrapers connected with some weird bridges for added coolness. There's a spelling error (‘sch’ written as ‘sh’, twice) in the original Dutch text here, which is not a big deal given the fact I was only nine years old at that time. However, to people who know me well it could seem surprising. I am not quite sure where I got the idea of a giant bird-shaped aeroplane, but most likely it was heavily inspired by the golden condor featured in “The Mysterious Cities of Gold” anime series. Unlike that one, which worked on solar power, the iron bird was made of steel and was powered by a roaring jet engine fuelled by fire crystals, whatever they are. Note the remarkable attempt at perspective in the last panel. It would take quite long until I would get the hang of drawing in perspective, in fact I would only fully master it after I had mostly stopped drawing these comics. You may have noticed the bookkeeping on the page: each row, and of course every page, is numbered. In later comics, I even counted the boxes (every 10th box was numbered). Even back then I was a sucker for useless statistics! The tiny Japanese-like icon in the bottom right corner on every page (that looks somewhat like ‘木’) is a kind of signature. It used to be a lot larger and uglier but I replaced it by something minimal to save on precious paper real-estate (which is especially scarce on the 7-row pages).